I might actually know what they're talking about even less than you??? Vote for Runewriters and get an extra doodle! This one attempts to make up for the things you're missing out on. Jonan's legs dragging beind Necropony is the best thing I have ever seen. That is the happiest necro-pony ever. I LOVE IT! HELLO I AM HERE FOR THIS SEV/JONAN PRINCESS CARRYING !!!!!!!!!!! Thought: Sev is going to let go better with his right hand than his left hand and then Sev is going to fall backwards on his head and it's going to be a disaster. Necropony might become cross. Oh my goodness, both of the vote incentive methods of carrying Jonan are AMAZING!! I'm almost disappointed Xira is going with them/offering Hache as transport. 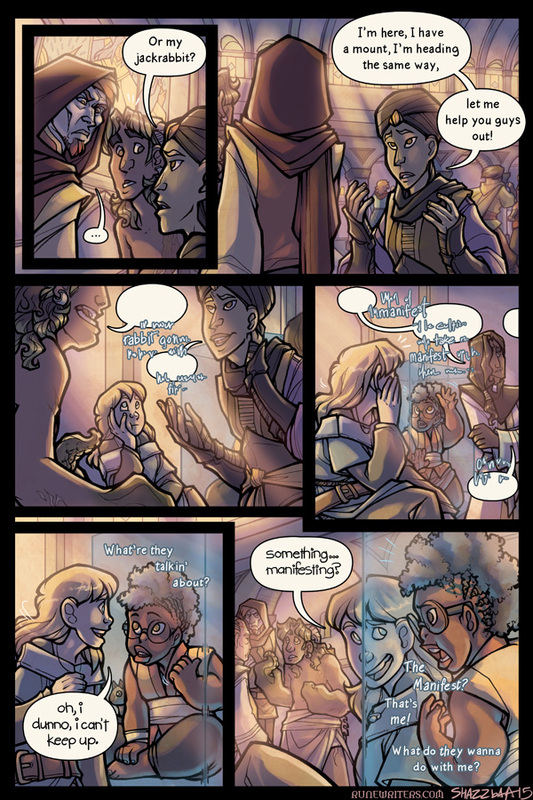 Even though he is turing his hooded back on the camera, I KNOW Jonan is rolling his eyes in panel 2. Sigh, you just ruined the pun I was going to make about the 'merry band of misfits and miscasts' :P Looks like I'll have to be quicker off the mark next time. random aside: once a friend and I were discussing whether or not a Runewriters Musical would be theoretically possible, and we both agreed that Jonan would get a song, where everyone on stage would freeze in place while he sang to the audience about how, it's not just him, right? Everyone here is an idiot? I want to see a Runewriters musical now. With a musical number with Xira and Tareth, and all of the extras are singing their thoughts, and Tareth doesn't notice a thing. Yes, please. OMG YES that is also amazing! Ooh, ooh! I'll write the bad haikus! Wait...are there bad haikus in musicals? I bet Tarri and Ember both feel much better about having no idea what everyone's talking about when they get to be clueless together. "I bet Tarri and Ember both feel much better about having no idea what everyone's talking about when they get to be clueless together." Yeah, it was a lot more fun to go to events and movies with another deaf/h-of-h person as we could commiserate on not understanding everything. "Did you get why everyone was laughing at that part?" "No. Why was that guy so mad after reading the letter?" "I think that's when he found out his wife was leaving him...?" It's nice not to feel so alone in the crowd. Oh gosh yes, being with someone else who can't hear is brilliant because you don't have to worry about a hearing person getting annoyed because they actually *can* hear what's going on and you're interrupting them. And in the previous page, did Sev say he'd fall outta the sky because he's too tired to be flying or because he'd manage something even less dragon-y than before and be too full of holes to take flight? re: Sev, it's a case of being too tired -- casting can get tiring all by itself, and he's already passed out once from trying to be a dragon when he was really too tired to be casting as it was (he hasn't slept in like?? 24 hours at least??? ), so turning into a dragon AGAIN and then flying with passengers is just a risky proposition all around!! I'd say the forcefield is weightless, but carrying a big square box is always a bother, whatever its weight - and with someone inside, even more so. It doesn't seem to be physical so much as a force, so it should respond to being carried. Even if it doesn't have weight. I love Necropony's "Prance-a prance-a"
No, Xira, Sev had this all under control! You can't just show up out of nowhere and solve everyone's problems like that! What are you going to do next, turn out to have some way of understanding Jonan with his mouth sealed shut? "Pssssh, no! That'd be...ridiculous! Ha-ha!" *cough* "Whaaaa?" OMG, it didn't even occur to me yet! This is going to be SO much fun! - Jonan uses a spell to break someone's leg, and a different healer tries to heal the person's leg. If the rune casts, it works, because there's no active magic there -- Jonan used a spell to do the breaking, but there's no magic keeping it broken. - Severian turns into a tiger, and a different shapechanger uses a spell to give him purple polka-dots. If the rune casts, it works, because the purple polka-dots, while they alter the tiger, don't actually oppose Severian's magic -- Sev's just trying to be a tiger, there's not any "no purple polka dots" magic there. - A fire elemental creates magic fire; another fire elemental tries to suppress it. Because this is direct opposition, then it would depend which runewriter is more powerful. "Power" is a really nebulous concept and there's not really a way to measure it -- it's mostly just understood that the guy who can summon a forest fire is probably more powerful than the guy who can summon a candleflame. This makes a lot of sense. It's a good rule of thumb for a system.